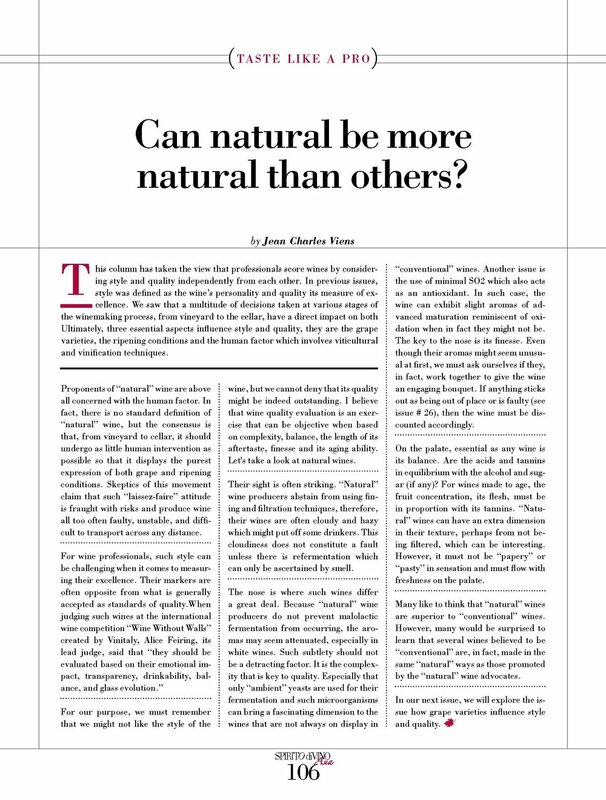 Can Natural be more Natural than Others? This column has taken the view that professionals score wines by considering style and quality independently from each other. In previous issues, style was defined as the wine’s personality and quality its measure of excellence. We saw that a multitude of decisions taken at various stages of the winemaking process, from vineyard to the cellar, have a direct impact on both. Ultimately, three essential aspects influence style and quality, they are the grape varieties, the ripening conditions and the human factor which involves viticultural and vinification techniques. For our purpose, we must remember that we might not like the style of the wine, but we cannot deny that its quality might be indeed outstanding. I believe that wine quality evaluation is an exercise that can be objective when based on complexity, balance, the length of its aftertaste, finesse, and when the style calls for it, its aging ability. With this in mind, let’s look at natural wines. Their sight is often striking. “Natural” wine producers abstain from using fining and filtration techniques, therefore, their wines are often cloudy and hazy which might put off some drinkers. This cloudiness does not constitute a fault unless there is refermentation which can only be ascertained by smell. The nose is where such wines differ a great deal. Because “natural” wine producers do not prevent malolactic fermentation from occurring, the aromas may seem attenuated, especially in white wines. Such subtlety should not be a detracting factor. It is the complexity that is key to quality, and one must concentrate on the many layers such wines can display. Especially that only “ambient” yeasts are used for their fermentation and such microorganisms can bring a fascinating dimension to the wines that are not always on display in “conventional” wines. Another issue is the use of minimal SO2 which also acts as an antioxidant. In such case, the wine can exhibit slight aromas of advanced maturation reminiscent of oxidation when in fact they might not be. The key to the nose is its finesse or its harmony if you prefer. Even though their aromas might seem unusual at first, we must ask ourselves if they, in fact, work together to give the wine an engaging bouquet. If anything sticks out as being out of place or is faulty (see issue # 26), then the wine must be discounted accordingly. On the palate, essential as any wine is its balance. Are the acids and tannins in equilibrium with the alcohol and sugar (if any)? For wines made to age, the fruit concentration, its flesh, must be in proportion with its tannins. “Natural” wines can have an extra dimension in their texture, perhaps from not being filtered, which can be interesting. However, it must not be “papery” or “pasty” in sensation and must flow with freshness on the palate. 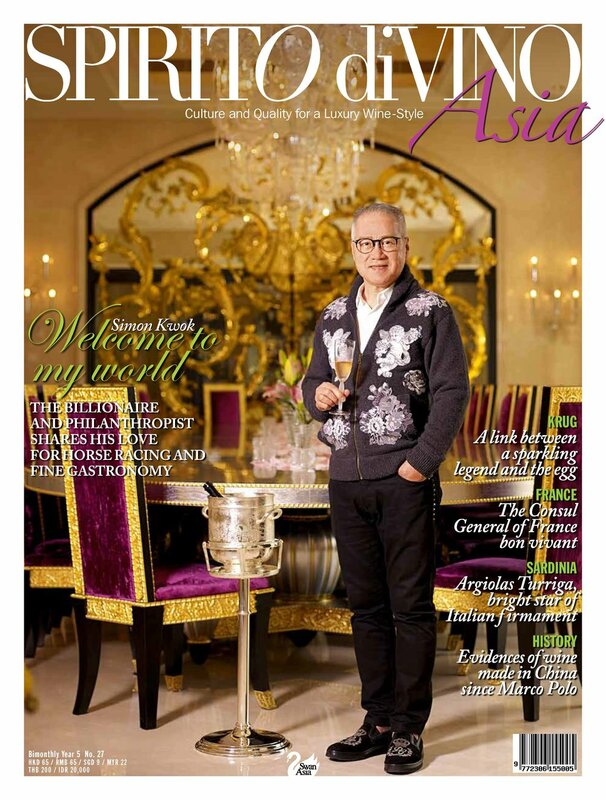 In our next issue, we will explore the issue how grape varieties influence style and quality.